JUPITER, Fla. - Jamie Sindelar, son of PGA Tour veteran Joey Sindelar, made a decision two weeks ago that should be talked about. Jamie didn't feel like his game was clicking on all cylinders, so he decided to stay home and work on his game instead of hitting the road to compete in Web.com Monday qualifiers. Jamie has played in several Monday qualifiers this year and admits they are very tough mentally. He has shot many respectable under par rounds that didn't qualify and left him feeling close but frustrated. Two weeks ago, Jamie decided to change his short term plan of hitting the road again for Monday qualifiers and instead stay home and play some Minor League Golf Tour events and work hard on his game. During the past 2 weeks, the MLGT hosted a 2-day event on the Champ course at PGA National (host of a PGA Tour event) and 4 different 1-day events. Jamie played all 5 events shooting rounds of 72-71-70-70-78-69. For the 5 events Jamie earned $2,351 in prize money. After spending $1,650 in entry fees he profitted $701 for the 5 events and admitted his game is in better form now than it was 2 weeks ago. Now $701 isn't a lot of money compared to the big purses on the Web.com and PGA Tour but considering 1 Monday qualifier costs in excess of $1,000 between the entry fee and expenses to get there, a $701 profit and a better feeling about where your golf game is at isn't the worst thing in the world. 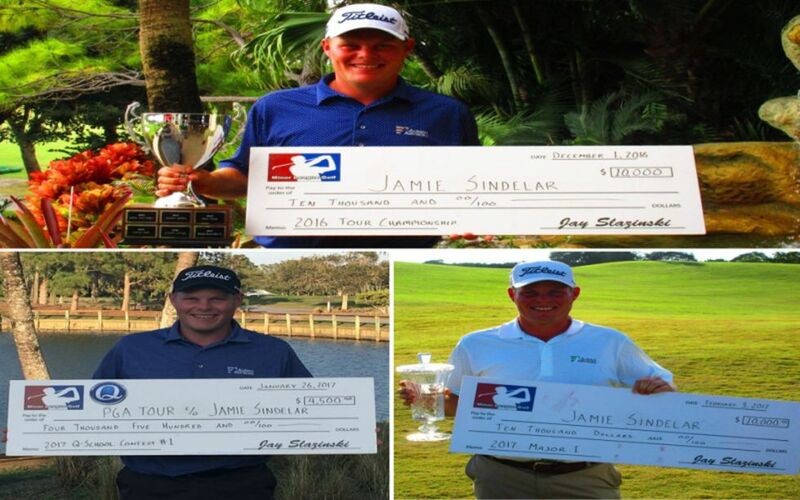 Jamie won the 2016 Minor League Golf Tour Championship, 2017 Web.com Q-School Contest #1 and 2017 Major #1 all within a 2 month span. His scoring average for the 8 rounds of those 3 events was 67.9 and he earned $25,985 in prize money. So we know how good Jamie's good golf is. Now at the Minor League Golf Tour, we realize that we aren't any players final destination, but we feel it is a very important part of the journey. So when you're game feels great and you're shooting good scores, hit the road and play in whatever you can to try to earn status on a bigger Tour. But if you're game doesn't feel 100%, sometimes it pays off to stay home an extra week or two and work hard on your game. Good luck Jamie in your next Monday qualifier and at Web.com Q-School this fall!